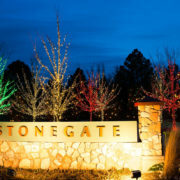 With technological advances in lighting options, homeowners have a vast array of options when planning their holiday lighting decisions. 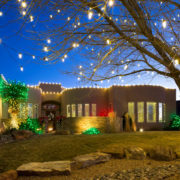 Today we look at LED vs. Incandescent and which is best for outdoor holiday lighting. These lights produce light by heating a wire filament inside a glass or plastic casing to a temperature that results in the generation of light. Incandescent lights are inexpensive to manufacture and are widely available. In fact, they are the cheapest lights on the market and they do have a good ability to render color. Incandescent lights have the worst energy efficiency on the market – around 10 lumens/watt. Most of the energy they consume is required to produce heat. They also have the worst lifespan on the market. So, while they may seem like a good deal, you’d have to purchase up to 100 of them to equal the lifespan of a single LED bulb. As you can see, this means high maintenance costs. 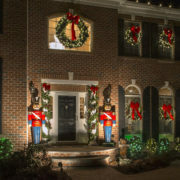 It is primarily for these reasons – low energy efficiency and high maintenance – that incandescent lights are not the preferred lighting product for outdoor holiday lighting displays. Who wants to climb a ladder to change a bulb on their roof-line? This is a task that is more than inconvenient – it’s dangerous. LED stands for Light Emitting Diode. A diode is an electrical device or component with two electrodes (an anode and a cathode) through which electricity flows. Unlike incandescent lights, LED lights have a very long lifespan. They can last 50,000-100,000 hours or more. An incandescent light lasts about 1,200 hours at best. In addition to their long lifespan, they are extremely energy efficient. This is largely because they waste very little energy in the form of heat, and they emit light directionally. Since LED light quality is high and maintenance is low, there is a strong case to be made for these energy-efficient products. Accessories: LEDs require far fewer accessory lamp parts. Color: LEDs can be designed to generate the entire spectrum of visible light colors. Directional: LEDs are naturally directional (they emit light for 180 degrees by default). Size: LEDs can be much smaller than other lights (even incandescent). Warm-Up: LEDs have faster switching (no warm-up or cool-down period). There are many grades of LED lights. For example, the LED lights that you find at the local hardware or big box department store don’t stack up against the commercial grade lights used by professional decorators. Christmas Decor by Arvidson utilizes all commercial grade lights for a better look that lasts longer than anything you will find at the store. Plus, you don’t have to deal with a box of tangled half burned-out lights in the garage from year to year. 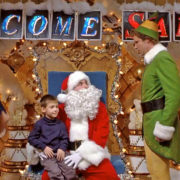 Have you grown tired of these annual hassles? If so, you’re not alone. According to IBISWorld Industry Market Report, seasonal decorating has grown 3.7% in the past five years. 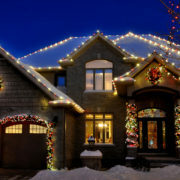 More and more, homeowners are seeking professional help for designing and installing their holiday light displays. Why Christmas Decor by Arvidson? We are a family-owned and operated business located in Crystal Lake (McHenry County) in the northwest suburbs of Chicago.